To Dr. Steven Feit, the best kind of dental problem is the one that never develops in the first place. 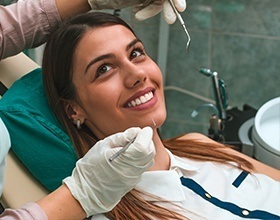 While he’s capable of handling even the most severe dental issues, he’d much rather help his patients maintain their beautiful and healthy smiles year after year with easy routine dental checkups. With the services detailed below, he can make sure the next time you eat, speak, or smile, the last thing you’ll have to worry about is your teeth! 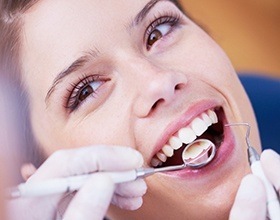 Dental checkups and cleanings give our team the ability to accomplish two very important goals. One, they help us get to know a patient personally, and two, they’re essential to us finding dental problems during their earliest stages. By coming in for routine checkups, we’re able to help patients by treating minor issues before they can do any real damage. 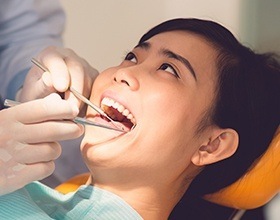 And, dental cleanings enable us to thoroughly remove harmful plaque and tartar from the teeth, gums, and dental restorations that regular brushes and floss cannot reach. It’s easier to stay healthy than become healthy. With a dental sealant, we can literally place an invisible shield around a tooth to keep it protected from cavity-causing plaque, bacteria, and acids. We simply apply a clear, plastic-like substance to the teeth in liquid form, and it quickly hardens into a thin barrier. We typically place them on the rough and pitted back teeth, as these are the most likely to develop cavities because they are quite difficult to clean while brushing. According to the latest research, as many as 1 in 3 Americans suffers from bruxism. What is it? It’s a condition where a person clenches their jaw and grinds their teeth while they sleep, which over time, can severely damage their TMJ (jaw joint), muscles, teeth, dental crowns, and dentures alike. 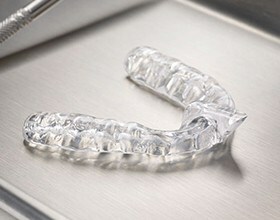 To help keep a patient’s smile protected during the night, Dr. Feit can recommend the use of a nightguard. It is called a custom permissive splint but looks like a simple night guard. It’s a small, custom-made oral appliance designed to fit comfortably over the teeth and place a barrier between them to prevent any unconscious grinding, protect your teeth and quiet your muscles which helps protect your jaw joint. 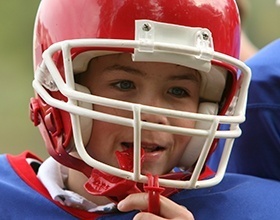 No matter an athlete’s age or level of play, a protective mouthguard, or sportsguard, should always be considered an essential part of their safety gear. Sports-related accidents actually account for about 40% of ALL dental injuries! Rather than wearing an uncomfortable and unreliable mouthguard from the store, Dr. Feit can design one just for your smile. It will be specially formed to fit your unique teeth, allowing for easy breathing and speaking, plus it will be much thicker and more durable than any generic sportsguard, making it a much better defender for your smile. We have made them for professional boxers and many other professional athletes as well. Oral cancer is an often deadly disease that is very survivable if treated early, but its initial signs are quite easy to miss, leading many patients to be diagnosed after the cancer has already become quite advanced. To make sure our patients get the care they need as early as possible, Dr. Feit performs a complete oral cancer screening as part of every routine checkup. He’ll examine your mouth and the surrounding area for any signs of cancerous or precancerous cells, and if he finds anything concerning, he’ll immediately refer you to a trusted specialist so you can get the immediate attention you need. Dr. Feit performed cancer research at Columbia Presbyterian Medical Center in New York City and also while attending NJ Dental School in the Department of Biochemistry. Fluoride is a mineral you’ve likely seen added to many kinds of toothpaste and local water sources, and that’s because regular exposure can dramatically lower a patient’s chances of developing cavities over time. 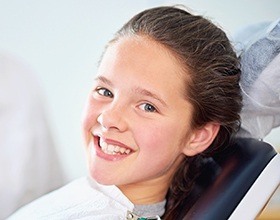 To make sure our patients stay cavity-free year after year, a fluoride treatment is standard at every checkup. We simply apply a highly concentrated fluoride solution to the teeth for a minute or so, and that’s it! It literally helps rebuild the enamel that has been lost due to plaque, acids, and bacteria, stopping tooth decay in its tracks. Did you know that the health of your gums is just as important as your teeth? Periodontal disease, better known as gum disease, is the most common dental problem in the entire world, and it’s even the leading cause of adult tooth loss here in the U.S.! 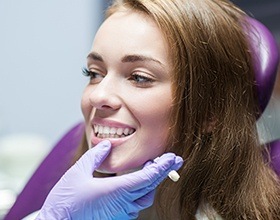 Using targeted periodontal screenings, deep cleanings, and antibiotic therapy, we can consistently find, treat, and eliminate this infection so our patients’ smiles stay healthy and whole for a lifetime.